Have you ever wondered what its like to think like the amazing Fitz? Find out below! Let's thanks Janice for that warm welcoming. Now, what are these articles about? Well, we're going to discuss things relative to Game of Thrones BUT with my own and unique style. That's right, entertainment at it's finest. Let's take a look at the demand we all have in mind: Give to Bronn a castle! That's right. He deserves a castle since he saved Lannister's asses enough times. We owe him for helping both Jaime and Tyrion staying alive, not sure for the upcoming season. But before going into subject let's take a brief look for his character. Ser Bronn of the Blackwater is a badass sellsword that first entered in Tyrion's company and later into Jaime's. The reason was obvious: Gold! He worked as a mercenary soldier for hire Trained in a dangerous way and being lethal makes him a good bodyguard for someone with money and the worst enemy for someone against him. I think Lannisters knew exactly what they were going through with him and that shows their smart mind. And the deeds was to save them from trial and on the battlefield. Heroic moments! A small competition. 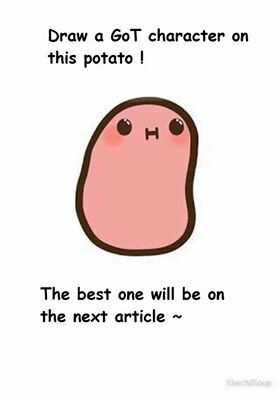 Below there's an image with a potato. Well, read what it says and you'll get what you have to do. The winner also will get a prize! Don't forget to send them into me by Raven!